Safe Salt provides just Sodium Chloride, but in a form which will not aggravate the stomach. This is ideal for horses which have had or are suffering with gastric ulcers. Salt in the diet is needed to replace what is lost when sweating. The majority of horse feeds do not add enough salt to the ration, so it is important to provide supplementary salt. Salt has been thought to aggravate gastric ulcers. Safe Salt has been bound in an oil, which is not digested in the stomach. This means it will pass straight into the small intestine where it is absorbed without any detriment to the stomach. 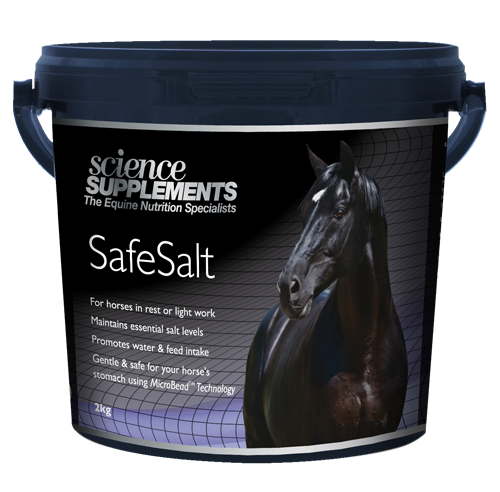 Safe Salt is perfect for daily use for horses which are not in hard work. Dosage varies greatly with size the size of horse and workload. A 2KG tub will last a 500KG horse in moderate work 47 days.